Are you one of those people who are always ill prepared for the weather? Do you get caught in freak showers? Accuweather Inc.’s app, aptly named AccuWeather Quick, will alert you as to when you’ll need your trusty umbrella and let you know when you can leave your coat at home. It’s a weather forecasting tool with GPS location-pinpointing capability for your iPhone and promises to “weatherproof” your day. The app comes with several nifty features that make it better than the iPhone’s default weather application. AccuWeather Quick allows you to add multiple locations and customize the system with English or metric measurements. Not only will you see current conditions for your selection, you’ll also see 12 hours of forecast for each day. Planning a weekend getaway or a day at the park? You can see up to 9 days of forecast on your screen. 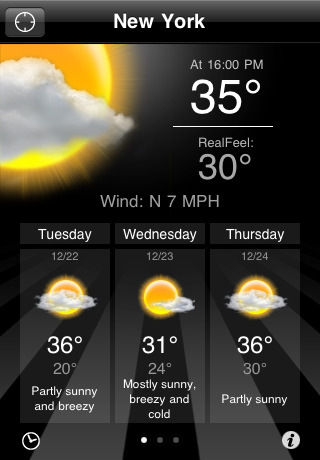 See the current weather conditions to view the details about what’s happening in your current location. It’ll come in handy when you’re getting ready to go about the town, or you’re planning on returning late from your Friday night outing. There’s also a radar feature that lets you see a map with current weather conditions. Sadly, that map is not interactive so you can’t zoom. The map also doesn’t list a key for the different colors on the screen so those of us who didn’t study meteorology may have trouble figuring out what the giant orange blob translates to. AccuWeather Quick is one good-looking, streamlined weather app. The graphics they have for different weather conditions are bright and colorful. The sans-serif font give it a casual feel. The screen shows the current conditions and the “real feel” so you’ll know if the weather will feel warmer/chillier than it actually is when factoring in all the weather conditions. The screen is also beautifully minimalist in that it shows three days of forecast at a time, and users can swipe their fingers to access the other 6 days. This feature makes it much more appealing than the iPhone’s default weather app which sticks all 7 days on one page (but lacks great detail). A simple tap of the lower left hand icon will switch the daily forecast to an hourly forecast. This simple switch is much appreciated. And if you want to switch between different locations, take advantage of the iPhone’s accelerometer and give your phone a good shake. Non-shakers and accident prone individuals like myself can also hit the lower right hand button and view their desired location. Best of all, there are no ads. AccuWeather Quick is a solid app, but it pales in comparison to its FREE version (called AccuWeather) which comes with a forecast that includes 15 days (6 more days than the lite version). AccuWeather also provides 15 hours of hourly forecast (3 more hours than the lite version). It also has weather indices (UV and Air quality), weather alerts, disruptive weather potential and risks, video forecast, and a map with interactive zoom ability. The only downside is that the free version has ads. I feel like AccuWeather Quick should have everything the full (free) version has, except sans ads. If you drop $0.99 for the AccuWeather Quick, you’ll be paying to get fewer features. That’s like paying for a slice of pizza pie when they’re giving away a whole pizza pie for free. Overall, it doesn’t make sense to pay for the full version when the free version is so heavy-duty and easy to use. Save your money for a rainy day so you can purchase another app from the iTunes store. AppSafari review of AccuWeather Quick was written by Linda Ta on April 1st, 2010 and categorized under App Store, Maps, Utilities, Weather. Page viewed 7264 times, 2 so far today. Need help on using these apps? Please read the Help Page.